THE SOUTH CHINA Sea covers an area of 1.35million square mi (3.5 million square km) bordered by he People’s Republic of CHINA, the Republic of China (TAIWAN), the PHILIPPINES, MALAYSIA, BRUNEI, INDONESIA, SINGAPORE, THAILAND, CAMBODIA, and VIETNAM. 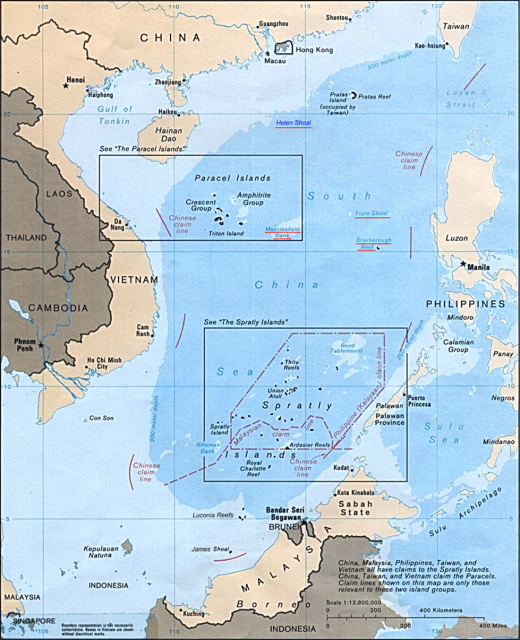 The South China Sea is a marginal sea, which means that it is part of the PACIFIC OCEAN but at the same time separated from the ocean by an archipelago. The archipelagos are placed together into four groups; the Spratly Islands, which are the largest group according to landmass, followed by the Macclesfield Islands, the Paracel Islands, and finally the Pratas Islands. All four of these groups are thought to be rich in oil and natural gas reserves, which naturally leave them to be contested by the surrounding countries. A healthy oil estimate in the Spratly Islands can be anywhere from 105 billion barrels to 213 billion barrels. The proven oil reserves, however, are 7 billion barrels. Production per day is 2.5 million barrels of oil. It is estimated that the natural gas reserves in the South China Sea may be the most abundant hydrocarbon resources in the region. The U.S. Geological Survey indicates that 60 to 70 percent of the hydrocarbon resources in the region are gas. Some optimistic studies suggest that 70 percent of the hydrocarbons believed to be located in the Spratly Islands will be gas. Natural gas usage by developing Asian countries is of utmost importance, as it is believed that usage will increase by 4.5 percent annually through 2025. Demand of natural gas will triple if this estimate is maintained. The Spratly Islands as well as the Paracel Islands are heavily contested by all of the South China Sea’s bordering countries. For example, the People’s Republic of China claims all of the four main subarchipelago islands as part of its Hainan Province. Vietnam claims all of the islands in its Khanh Hoa Province and occupies one of those islands. Taiwan claims all of the Spratly Islands and occupies one (Taiping). Malaysia occupies three islands. The Philippines claim most of the Spratly Islands and occupy eight. Brunei and Indonesia claim not the islands but instead the entire South China Sea. On a historical note, however, it is easy to understand the importance of the South China Sea in relation to the surrounding economies. For example during the Han Dynasty, the South China Sea was the starting point for the Silk Road on the ocean. It started in the South China Sea moving on to INDIA and SRI LANKA. It crossed the northern end of the RED SEA and ended in Rome, Italy. Today, it still maintains its economic importance as the world’s second busiest international sea lane. Annually, it has half of the world’s supertanker traffic passing through its waters.